SINGAPORE - Income inequality has become the fashionable thing to talk about at cocktails, in articles and even books. 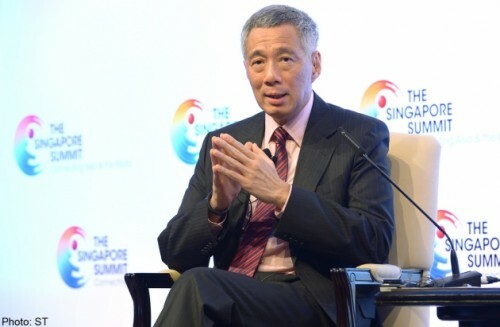 But the the way to deal with the growing gap between rich and poor is through real and concrete solutions, Prime Minister Lee Hsien Loong said yesterday. Among them are equipping people with skills that are in demand in the economy, and redistributing wealth so that everyone has what former prime minister Lee Kuan Yew called "chips to play with". These are among the measures that individual governments can take, PM Lee said, adding: "The income inequality will be there, but in absolute terms, we can improve lives for nearly everybody in the society, provided they work and are prepared to make the effort." He made these remarks in a dialogue at The Singapore Summit, where he was asked questions ranging from Singapore's growth model and the Trans-Pacific Partnership, to Scotland's quest for independence. The annual conference, organised by government agencies, brings together chief executives and financial leaders. Themes this year included sustainable growth, Asia's economic integration and the global energy market. On inequality, he was asked how Asian governments can arrest the trend caused by rapid growth. To this, he said inequality was not the result of rapid growth. There was inequality in Europe, the United States and Japan, where growth has slowed. Rather, globalisation and technological advancements were what contributed to the trend. Workers now had to compete with hundreds of millions of lower-paid workers joining the global economy from China and India. And technology has seen jobs automated - with robots and computers taking over tasks of skilled workers. Acknowledging that income inequality caused social tensions and unhappiness, and that solutions were needed, he cautioned against "theoretical solutions", such as having a global wealth or income tax. What governments can do is to help people get skills that are in demand - not just for those with a university education, but those who are technically inclined. Singapore has also taken other measures: public housing and home ownership, and providing good subsidised education and high quality health care to all. "And therefore, we level up and we enable a greater sense of equity and justice in the system," he said. To another question, he said the process of reinventing Singapore so it can stay competitive was neverending. The country had to find ways to move ahead despite the resource constraints it faces. "What we need to do is to reuse and exploit over again the spaces we already have: higher, deeper, smarter, better integrated, better designed with urban planning, with economic renewal," he explained. "It is really the renewal of your people and their skills and to be able to engage them... to operate in a consistent and aligned direction, and not all pulling in different directions. Lots of smart guys, results zero, which happens in a lot of countries. But (this) must not happen in Singapore." Asked why there were those here who were not satisfied despite having much of what many others in the world would want, he said he had accepted this as the human condition: "That wherever you are, (you would) like to be better, and wherever you are not sometimes appears to be better." He added: "I think we are at a good level by international standards. But I would be very saddened if we concluded that we are unable to improve because we have reached perfection. That is the surest way to go downhill... No society is static and reaches a level of perfection. We will always want to have that passion to improve. But you should also have some of the Buddhist acceptance that resources are finite and desires are unlimited." At the 45-minute dialogue, he was also asked if countries should allow free movement of labour to spur growth and reduce inequality. He said Singapore had to manage its population and workforce growth so as not to tax resources and infrastructure. "If we just open our doors and say everybody can come, free movement of labour, tomorrow, there will be one million people on their way here, maybe more. Some will fly, maybe more will come by boat, and I think it will be a very different Singapore. So, you can't do that," he said. "We have to grow in a way that is sustainable, and we must be able to manage the inflow in a way that talent can come in and people who can make contributions to Singapore can come in and will be welcome in Singapore. And that is what we are trying to do."